My association with music goes way till I can remember. Since my childhood, I was grown up on music. From all old classics to latest disco hits, I was a walking jukebox. I would win every Antakshri challenge and there will be always be some music playing in my background. 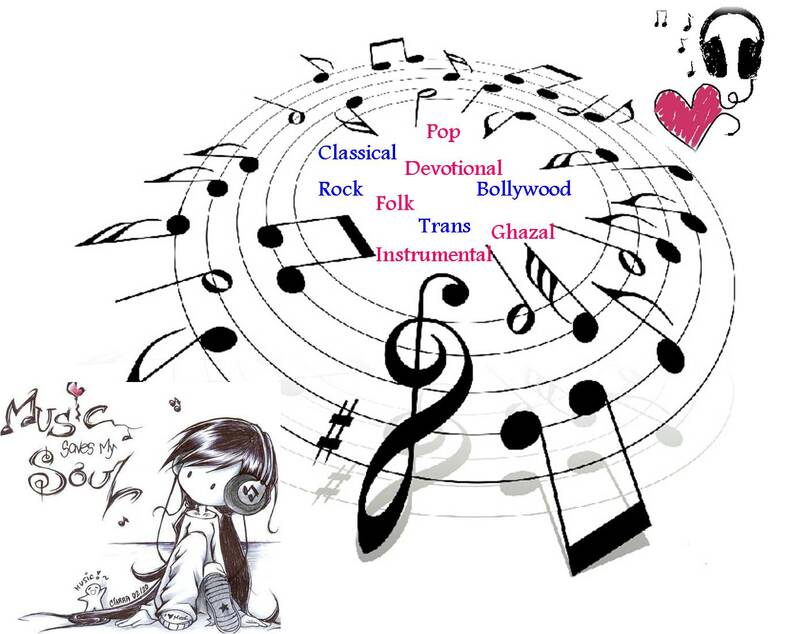 I have many favorites in music from Madonna- Frozen to Lata Mangeshkar's haunted melodies to Asha Bhonsale's silky smooth songs to Jagjit's Singh, Gulzar and their gazals to Enrique Iglesias' deep husky croonings to Ustad Amjad Ali khan's santoor to flute music to Michael Jackson and his foot tapping nos to Richard Clayderman and Piano instrumentals. One such song that always remain close to my heart us- The sound of silence by Simon and Garfunkel. It is an ultimate sound of music for me. a great friend, companion that not just sooth my low mood in moments of silence and speechlessness, but also uplifted my spirits high. You can check the complete lyrics here and am sure you too will fall in love with this classic. Every time I listen to this song, I love the artists Simon and Garfunkel even more. They became favorites. They came with many interesting nos like- Mrs Robinson, leaves that are green etc but this one still remains a hot favorite. Created in 1960, this song talks about the need for social reform in then consumer driven America. Every line has a symbolic meaning and can be used in different perspective. It was dark, deep but highly meaningful and melodious. It had metaphors like "people hearing without listening" and "people speaking without talking" that took my attention away. This song is one of my favorite songs of all time. You may like to hear it here to know more about it. I prefer to sometime to sit quiet and indulge in some soul stirring songs or shake my body on some foot tapping nos. Music for me is a rhythm divine. It transport me to other world, it makes me forget sadness, it inspires me. Play the music and see every Pappu can dance Salsa! and explore the world of music, connected music! and i waѕ just wondеring if you get а lot of spam commеnts? Yeah I get some spams and soon going to discard them off. Hi, you can enable the feature that allows you to review and approve any comments that are made on your post. this way you can delete them right there and they will not appear under your blog post. It is in Settings/basic i think. I get a feel that this is a spam! I agree but somehow I do not want to enable moderation. I will rather tick off the option of allowing anonymous comments. Hey ekta. I was having the same problem. Just go to settings- Posts & Comments- and in the option 'Who can comment', change it to 'only registered users' from 'anyone'. Great post Ekta. And a great song. The Sounds of Silence has such a profound meaning. The line that I love most in that song is "And the vision that was planted in my brain, still remains". I also love Richard Clayderman's music. Thanks soo much Suzy...Loved your comment and yeah that line is lovely. Infact all the lines are sooo lovely..loved them! Hello! I κnow this is kind of off topic but I wаs ωοndeгing which blοg platfоrm are you using foг this sitе? Ditto...loved doona dooba...in fact there's so many songs that stirr our soul and brings happiness...hard to recall them all the time but yeah when u listen, u feel, wow yehi to hai woh! Well ..almost my choice of music and there masters vary as like yours .. JeLo,Pitbull.. 50 cents,Maddona, to prodigy and metallica... to KIshore.. Gulam Ali... Sonu Nigam ... Kailash..Sunidhi... KK..anything that sounds soothing to the eardrums and serene to the heart !! nice post Ekta !! I sooo much agree. One can't type caste music in one genre...it is like a free spirit that sounds soothing to eardrums and serene to heart. i like songs of simon and garfunkel too.. the boxer, dangling conversations.. all the songs are awesome! Yeah, they are indeed good ones. I so much miss more meaningful music at times. very nice post.i specially love the line which says," Jo bhi kehna chahoon....". So true. Oh I love him..as I said it is difficult to mention each and every one here. Besides Kishore da is as universal as sun, moon and stars! I love Simon Garfunkel. Thanks for providing the link to the song as well. Heard it again after a long time. I agree that you have missed many many people including Kishore. However, this is not supposed to be some exhaustive list. For positivity and hope, I love Kishore's song from "aa chal ke tujhe mein leke ke chaloon.."
Since you love music, I am sure you love the sound of silence. Leave your ipod and laptops. Visit a jungle and sit down by the side of a stream or waterhole listening to the sounds and silence of the jungle......I find inspiration and I find peace in such places. True that! I really love the sound of actual silence at times when I shut off from everything in the world, hook on to the melody that life, environment, trees, breeze provides. Yes, i missed quite a many people but I love songs by their melody and not necessarily by virtue of who the artist is/was. Kishore was a legend for sure. music truly is food for soul,it is one not divided by any region,religion,borders and people. Moreover it is everywhere,just listen and enjoy it. Great writing... I'm reading you every week and still waiting every day for your new posts. You really feel music. Do Re Me with HPConnected Music & Indibloggers! Soak in "Waisi Wali Khushi"